Team Uvirith started with the original creators of Uvirith Unleashed (Grumblepunk), Uvirith Vault (ThaEgbird), and Uvirith Inside (DopeHatMan), as well as Vorwoda who made the Advanced Shock Centurion. Together, they attempted to make the ultimate Telvanni mod, Uvirith Awakened. Unfortunately, the project fell into limbo, but they inspired me to continue where they left off. I decided to form a Team Telvanni with bhl, the modder who took over Pozzo’s Rise of House Telvanni, and cyran0 who became custodian of Ostar’s LGNPC Tel Uvirith. However, this time it we would have separate, but integrated mods. Along with Artimis Fowl, who made Building up Uvirith’s Grave compatible with Uvirith’s Legacy, and with all kinds of help from Arcimaestro Antares, we set about creating the Ultimate Telvanni Experience. Kiteflyer: biggest thanks for making me so many models on request, and sharing whatever else he has on hand with me. Kite created the large Telvanni bookcases and long shelves, the new crows cages used in the prison, floor shackles and manacles, the cat o’ nine tails and riding crop, and letter openers. Melchior Dahrk: Telvanni trapdoor was made on request for UL. Many thanks. Arcimaestro Antares and Animated Morrowind were used for all NPC animations used in Uvirith’s Legacy. Antares also made the Daedric Portal and Telvannis platforms, and he made the Telvanni pod-shelves for me on request. Karpik777 made the small shelf used in the modular shelfpods in the vault, and also put together the Telvanni Meshes resource. Petiboy re-textured the Telvanni flags on my request. Minamir made the cookie jar mesh on my request. Fez was created on my request by Chaka ZG. Uvirith Awakened, and Team Uvirith. Some of the unique meshes for UA were included in this mod, with permission from DopeHatMan. This includes Sara’s unique head and hair, the black robe (formerly the Robe of Sorrows), and the crystal ball in the secret lab. The crystal ball in Galdin Manor is also from Uvirith Awakened, but uses base Telvanni textures. The summoning floor texture from UA in Master Llapp’s training room has been re-done at a higher resolution, with added alpha transparency so it can be used on top of any floor. You may use this as a resource in your own mods so long as proper credit is given. Apprentice Gavyn’s head and hair: retextured from Better Heads by Gorg and Anthrax. Some elements of Slof’s Vampire Faces were inspiration for Gavyn’s vampire head, using Rhedd’s mesh. Miltiades Playable Dremora was used for both versions of Ash-Kosh. Korana and Oom Fooyat. I used some of their meshes and textures to add some flair to the Tel Uvirith tower. The throne in particular was a much needed touch, and Korana’s rug looks great in the throne room. Cali’s silverware tea sets from Cali’s Kitchen are found in the upper tower, but use the Tea Mod’s IDs so you can use them to make tea. Kw’s Rich Furniture was used for the Alchemy Table. Rings and Amulets by Daduke (with meshes by IggyEguana) and also Daduke’s Key Replacer makes all keys, rings, and amulets added by Uvirith’s Legacy unique for easier identification. Dongle’s Water Pack, is used in the tower kitchen and barracks. Dongle’s Glass Display Case is used in the lower level of the treasury. The daedric bottle found in Ashkosh’s Lair comes from Mehrune’s Accessories. The harpsichord comes from his Musical Instrument Pack. The tribal scimitar comes from his Weapons Pack. Indigo’s Display Case is also used in the lower level of the treasury. Kieve’s Dark Telvanni Construction Set is used in parts of the dungeon and the high security prison. I also used resources from his updated Dark Telvanni Tileset. StarCon5 made the filled bookcase mesh used in the library. I have altered the original texture somewhat to fit the library’s atmosphere. Lady E’s rack, crows cage, torture chair, and display cases are used in this mod. Lumi’s Daedric Tools by Luminar Nightblade are used as the special apparatus in Deavvo’s secret lab. Faylynn’s Imperial Fireplace textures. I needed something more suitable for a Telvanni in the imperial styled section of the vault. I renamed the texture files so it doesn’t change all the imperial fireplaces in the game. Connary’s Brown Book texture is from LGNPC Tel Uvirith. Vial and blood vial textures are from Vampiric Hunger III 1.2. Azura and Merhunes Dagon statuettes were from Daedric Statuettes by MagicNakor and GreenEyedYam, but are no longer used in version 3.0. I’m using my own converted from the large daedric statues. Headstones for Gavyn and Sara are from Barabus’ Graveyard, as well as the coffin. 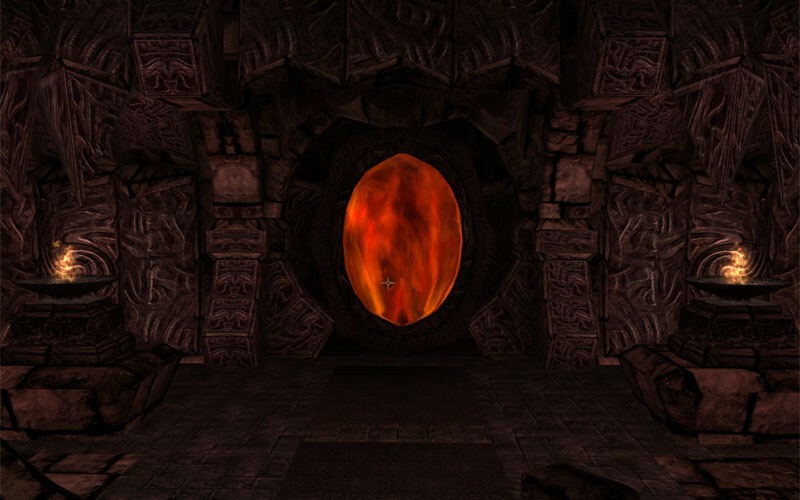 He also made many meshes for the included NOM food, and the fire poker in the prison comes from Barabus’ Fireplaces. Telvanni crystal used in Weather Control Device is made by JonSatriani for Oblivion, and modified for use in Uvirith’s Legacy by Karpik777. Aged Cephalopod Armor and the Telvanni Robe for the Robe of Sorrows comes from Mr_Malcontent’s mod. Xeth-Ban and JennaK: Tale of the Devious Trader book art and meshes are included for the book-sorter, but the actual book has not been placed in the game. For that, you’ll have to download Xethban’s mod. NoM items are from Neccessities of Morrowind by Taddeus & NymeriaPsychopie. Sara’s Tiara was modified from Gorg’s Female Hairpack III: Hair and Tiaras. The Nifty Magical Rock Dingus, and Sceptre of the Sepulcher are re-textured meshes made by rdjeke from his mod Tools of the Art: Wands. Hold it resources (the quill in Almossaren’s hand, the broom etc.) are by Danae. This mod also contains the fixed mesh for bloatspore by Gez. Soralis’ Chess v3 was used to create the Chess add-on for Tel Uvirith. Bud_Lyte_kNight’s Leveled Animated Practice Dummy 1.0 (modified from Acidbasick’s Animated Practice Dummies 1.0 was used to create the modified practice dummies in Uvirith’s Legacy. The library book sorter was adapted from Mori Mountain Estate by Marc. Resources from The Bathing Mod 2.0 by Gaius Atrius were included for compatibility. Hurdy Gurdy made the female robe mesh used for the Robe of Sorrows. Texture was modified from Mr_Malcontent’s warlock robe. NoLiv made the female robe mesh used for Verena’s robe, the Telvanni Servitor Robe, The Archmagister’s Robe, and the Dangerous Dress. I did the textures, and Arcimaestro Antares helped me add the pauldrons to the mesh. Robert’s child body meshes are used for Gavyn in the CoM add-on. All other resources in this add-on are directly linked from the CoM bsa and require Emma’s Children of Morrowind to be loaded. The large clay urn from Sil’s Pottery by Silaria was used for Gavyn and Sara’s cremation urns. I also used many of Sil’s vases and urns in Gaius Varres manor. Thanks, Daywalker, for helping me perform surgery on a couple Dwemer centurion meshes to create the heads for Primus and the tower centurions for their repair sequence. Ash-Kosh’s female cuirass in the UL_AshArmor_Plangkye plugin is made by Plangkye, based on BB meshes from PsychoDog Studios. It also includes the glow maps, but not the textures, from Ghostnull’s Glowing Daedric Armor (so as not to override your own chosen texture replacers). Uvirith’s staff is from Midgetalien’s Goris the Maggot King. Mesh is by Trey Leavens. Daedric lamp, plate, pitcher, and bowl come from Daedric Resource 1 (while the daedric candle, altar, and chest are by me). The Wanderer created the dock hoist, awl, hourglass, wall shackles, balance and weights, and prison toilets. You can find them The Wanderer’s Mod Pack 3, and Dockside Clutter. Melian created the glass funnels and chaise lounge, and helped with companion scripting. Illustration for N’tashra scroll is by Edmund Dulac. Skeleton Race is by Shannon Workman, with head and hands by Cheezproof. Shwaa created the scroll meshes used in the UL scroll sorter and scrolls (retextured by me), as well as many of the potion bottles used in the potion rack. Other bottles used in the potion rack are by Qarl, and AnOldFriend and Bycote. I made the Gold and silver potion bottles. Runspect made many models used in Uvirith’s Legacy 3.0: I retextured the globe to make it a Tamriel map rather than a Vvardenfell map. I also used his pile of wool, sewing set, metal box (for the combination trap chests), as well as his armchair and long table in the prison. Version 3.1 adds his dark throne to the secret lab. Qarl’s small round end table and crystal ball come from Kayla’s Knick-Knacks. Qarl’s quills and inkwell meshes are used in version 3.1, as well as his bowl mesh (with my own textures). The inkwells have been retextured using UA resources. Chron Ventri: more display cases. Phaedrus: skull candle comes from More Lights, and I also used resources from Velothi Pits and Imperial Tiles. DonnerGott made the Inverted Velothi Interiors. Broken bottle is from Asylum and Teli’s Junk Mod. Square pillow mesh is by ra5946, found in Silk Dragon Imports. Bullwhip is by Dalestocker, from Whips Plus. Battlehammer is by Lord Delekhan. Skull sword is by Blademaster. Ebony katana and Dragonis are by Phijama, using advanced scripts by Melian. Imperial Saber is by Southern Comfort. Trenam Faren’s weapon racks are from Weapon Rotate (no scripts on them, unique IDs). Meshes are by Maboroshi Daikon. My mods also use scripts from Book Rotate, by Cydine & Maboroshi Daikon. Spirithawke fixed the slaughterfish mesh so it could be resized on my request. Emma, Kateri, and Melian taught me a lot about companion scripting, which Grumpy (RIP) pioneered. Fliggerty taught me much about scripting in general, and so did Yacoby, but I’d have to say Melian and abot have put in the most time helping me debug scripts. Thank you all for being so generous with your time and expertise. Abot continues to find Uvirith’s Legacy fixes for players while I’m away, Jasons073 does extensive bug tracking during my absence as well, and Dragon32 is always helpful to players having problems on the TES forums. Version 3.0 and up wouldn’t have been possible without all your continued efforts. Thank you. Thank you, Jac, for your contributions to Books of Vvardenfell. Kiteflyer, Spirithawke, Chaka ZG, Melchior Darhk, Karpik777, Minamir, Petiboy, and Arcimaestro Antares have all been quick to whip up models on my request or offer them up from their unrelease archives. Thank you. Thanks, Leonardo2, for uploading all my mods to Morrowind Modding History. Thank you and Fliggerty for preserving Morrowind’s mods. Thanks, DopeHatMan, for letting me use elements of Uvirith Inside and pointing me to Uvirith Awakened for some inspiration. Thank, Psyringe, for coming up with some hilarious responses for the librarian. Everyone else in the TES forums who have helped with my scripting or pointed me to modder’s resources for this mod. And also anyone who’s taken the time to help me track down bugs. This mod wouldn’t have been possible without all your help.